Climb trees, hike, rappel, or simply explore caves, unique experiences which gets your adrenaline pumping. You float into the forest, swing from tree tops, descend past trees, get back to ancient arboreal roots at an adventure site called Unique Outdoor Experience where travelling through the treetops is the way to go. You climb over 100 feet into the canopy of the forest for a truly awesome view while swinging along Tarzan style. Zip lines, tension bridges, rope work and rappelling were used by forest ecologists and scientists to study plant and wildlife up in the tree tops or canopy. For this reason a lot of the activities at the Unique Outdoor Experience are called canopy tours. This has now become extreme sport and a rage throughout the world. At the demonstration site, the guides explain how the system works. They teach you safety instructions and how to gear up and zip line. There are 4 guides who spread out onto different platforms. This allows you to zip quickly from one platform to the next where a guide will clip you to the next zip line. There are several bridges, a hanging bridge, and finally as rappel. The cave adventure can be scary and not meant for the weak hearted. The task begins with crawling into the cave in water waist deep, followed by rappelling in the river inside the cave. As you enter the cave you hear squeaking noise. The cave is home to a strong colony of bats. They stir themselves as they sense dusk descending and begin to prepare to leave the cave to feed on flying insects. The path continues to wind deeper into the blackness, until suddenly a green oasis appears in the distance. A large waterfall tumbled into an interior pond. The pond is like a bliss pool and you can jump from the waterfall into this varnish clear water. The trips are carefully planned with emphasis in Puerto Rican culture, legacy, education and ecotourism. The team work with spirit, adventure, and leadership skills. There is a minimum weight of 50 pounds and a maximum weight limit of 250 pounds. Minimum age is 8 years old. It is a bit of an uphill climb, but they make sure you take your time and have a safe experience. They offer drinks and snacks at the end of the trek. The hike between the office and the zip line course is steep, and it can be muddy and slippery when wet. You also must be in decent physical shape. There are some steps up to the platforms. You must wear closed-toe shoes with good grip such as sneakers or hiking shoes. Like all zip lining activities, the harness is tight around the legs, so wear long pants or long shorts to protect your skin from harness chaffing. If you're happy, tip the bar tender, tour guide or tour operator. Tips are appreciated because they are not included in the price they charge you. They need a minimum of 2 people to do a tour. If you’re a small group, they will put you in with other people. The tour takes about 3 hours, but it could be more or less depending on the number of people on your tour and how fast everyone goes. They can help arrange transportation for groups of 4 people or more. Tours depend on the package you choose. Canopy Tour - Half Day or Full Day. 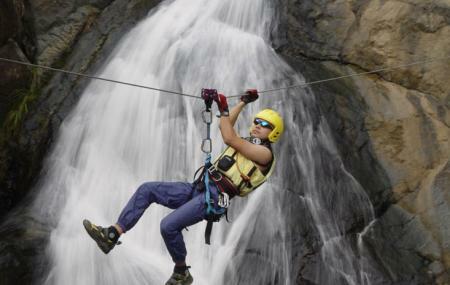 Rappelling Tour - choose your destination from Ponce, Ciales, Quebradillas or Bayamon. Treasure History Hunt from Ponce Downtown and Old San Juan. Camping in Ponce Orocovis, Quebradillas, Utuado or Canovanas. They also offer a night time trip around the nights of the full moon. How popular is Unique Outdoor Experience? People normally club together Cavernas De Camuy and Arecibo Observatory while planning their visit to Unique Outdoor Experience. People also prefer to start their day with Unique Outdoor Experience.